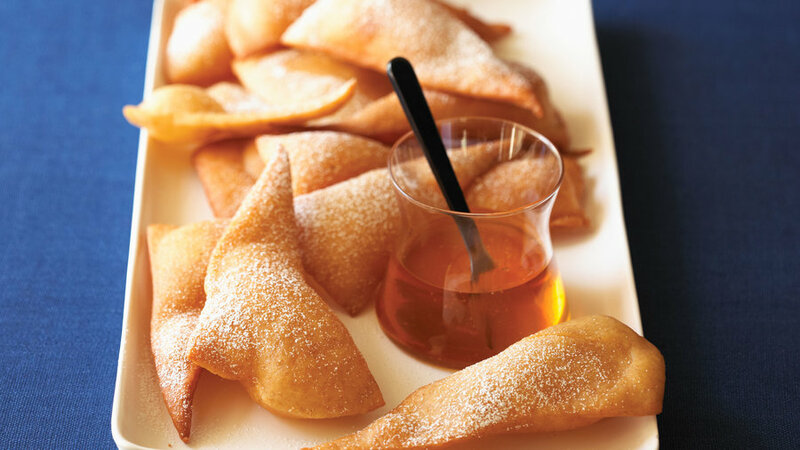 Sopaipillas, airy pillows of fried dough, traditionally drizzled with honey or sprinkled with powdered sugar, are one of the Southwest’s great treats. 1. In a large bowl, dissolve yeast in 1/4 cup warm (100° to 110°) water for 5 minutes. In a 1½- to 2-qt. pan, combine milk, the lard, sugar, and salt; heat to 110° and add to dissolved yeast. With a wooden spoon or stand mixer fitted with a dough hook, stir 3 cups all-purpose flour and all the whole-wheat flour into the yeast mixture; beat until dough is stretchy. Stir in another 1 cup all-purpose flour to form a stiff dough. 2. Beat on medium speed until dough pulls cleanly from side of bowl and is no longer sticky (or knead until no longer sticky). If it’s still sticky, add more all-purpose flour, 1 tbsp. at a time, and beat or knead until dough is smooth. Put hand-mixed dough in an oiled bowl and turn over to coat top. 3. Cover dough with plastic wrap and let stand in a warm (about 80°) place until doubled in bulk, about 1 hour. Punch down dough. If you’re not ready to cut and fry dough, cover again and chill up to 1 day. 4. Knead dough on a lightly floured work surface to expel air. Cut into 4 equal portions. Working with 1 portion at a time, roll into a circle about 1⁄8 in. thick; with a floured knife, cut into 6 equal wedges and lay in a single layer on a floured rimmed baking sheet. Cover with plastic wrap and chill while you roll and cut remaining dough. 5. Pour enough oil into a 5- to 6-qt. pan to come 1½ to 2 in. up side of pan. Heat over medium-high heat until a deep-fry or candy thermometer registers 350°, then adjust heat to maintain temperature. Drop one or two pieces of dough into oil. With a slotted spoon, push them down into oil until they begin to puff. Fry until pale gold on both sides, turning over as needed to brown evenly, 2 to 3 minutes total. Drain in paper towel–lined pans. Fry remaining sopaipillas the same way. 6. Serve immediately, or keep first ones warm in a 200° oven until all are fried. Serve plain or dusted with powdered sugar, and set out honey for drizzling. Quick Tip: For a shortcut, replace the homemade dough with two 1-lb. loaves of thawed frozen white or wheat dough; then, in step 4, cut each loaf in half and roll out thinly. The sopaipillas are quite large, so feel free to halve the recipe. Make Ahead: Through step 3, up to 1 day, chilled; cut and fry dough the next day. Fried sopaipillas, up to 1 day, stored at room temperature; up to 2 months, frozen in resealable plastic freezer bags. To reheat fried sopaipillas, thaw (if frozen) and bake, uncovered, in a single layer on baking sheets in a 300° oven, turning once, just until warm, 5 to 8 minutes. Do not overheat or they’ll harden. Per Sopaipilla: 197 cal., 55% (108 cal.) from fat; 3.3 g protein; 11 g fat (2.1 g sat. ); 20 g carbo (1.2 g fiber); 105 mg sodium; 3.7 mg chol.